A beautiful uplifting tag...Thanks Tonya! Did you know that you can order these stamps in 3 different mounts, Plain Red Rubber, Cling Mount, and Wood Mounted? It is awesome to have options! 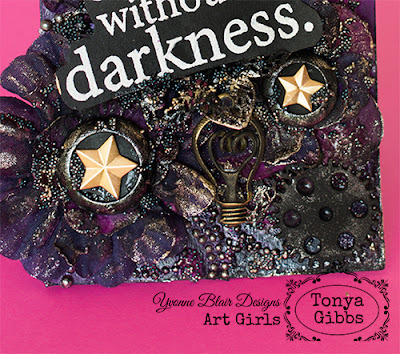 I'm using Lindy's Stamp Gang Limor Webber Designs Neon Graffiti Flat Fabios in Urban Amethyst, Poppin' Pink, Blazing Black, and Sidewalk Chalk to color my tag. 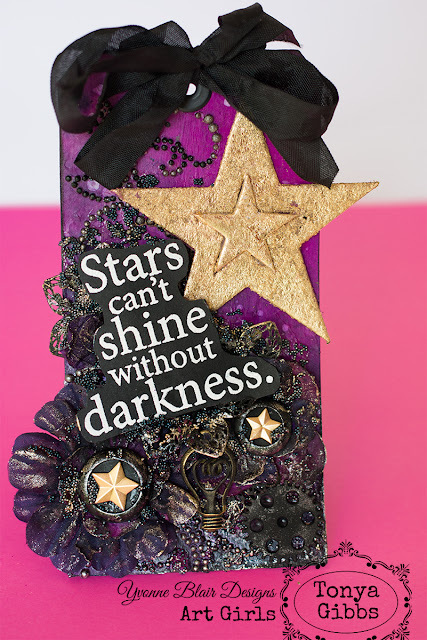 I used white embossing powder on black cardstock to make my stamped image pop. I love the chalkboard feel this gave to my text. This will help my text contrast with the rest of the tag, and reinforce the sentiment. I love for my tags to have a theme or tell a story. My tags theme will be emerging from the darkness into the light. If you have crafted for a while you probably have lots of Prima bling in your stash. I decided to use it to represent the chaos that seems to follow us in the darkness, spinning us out of control. Notice I'm placing them at the bottom, burring that chaos. 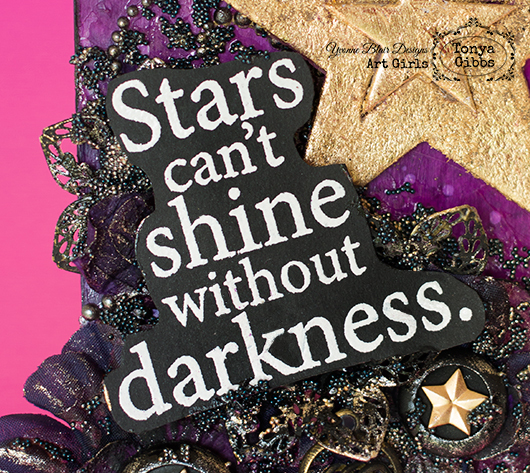 I used some of Marion Smith Designs Junque and Gems Metal Flowers that had a star shape to symbolize how our sparkle is sometimes dulled by the darkness. As you can see it still has a little shine, but it is consumed in the dark. The light bulb is another one of Marion's gyms and it symbolizes the light we feel when we emerge from darkness. The gear represents the work it takes to leave the dark and travel into the light. The tiny seed beads reminded me of pollen. As I spread them around I thought about how our attitude can pollinate those around us, or vice versa. 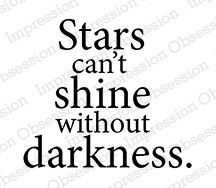 Sometimes the weight of the darkness is perpetuated by the negativity of others, and if we can find a piece of something positive in its wake, and hold onto that, we will soon find our light. I like to think that through every dark moment in my life, there was a lesson I needed to learn. I try to figure out what experience I need to gain from this darkness to better my future. As I begin thinking this way, I notice a shift in my attitude, and light entering my world. I no longer feel suffocated, but instead enlightened. 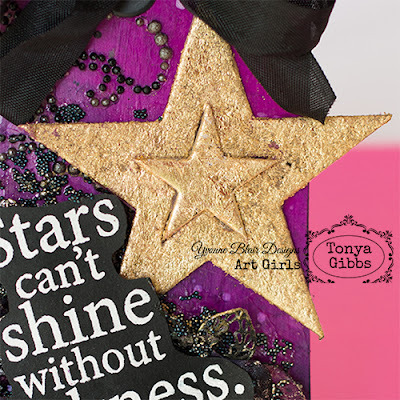 I decided to brush a little Viva Precious Metal Colour Gold on the high points in my darkest areas of the tag to show how the light can spread. 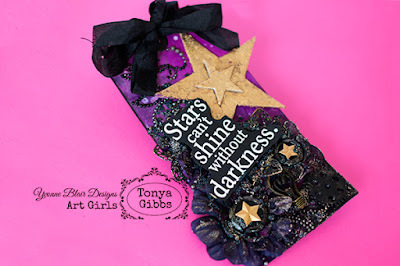 I hope I have inspired you today to reach into those scraps, pull out a few hoarded supplies and create a tag. I like to hang these tags on the wall in my studio, and I also like to share these with other crafter buddies as I meet them.